Everyone is familiar with Spring Cleaning - I find that only having a big clean up once a year is not enough, so I like to do a big clean up around the house quarterly, around each season. I do a big Winter clean up in January, to get everything cleaned up from the holidays. A spring clean up to prepare for summer. A summer clean up usually involving the garage and the yard, and a Fall clean up, to tidy up from summer fun and prepare for the upcoming holiday season. With the children back in school, it is time for my Big Fall Clean Up. After a nice, laid back summer, the house tends to get a little neglected. Different areas around the house get a little disorderly, and need to be set right. I always start with a big master cleaning list. I go through every room and space in the home and make a list of things that need attention, as well as regular cleaning projects. Every room get a very thorough vacuum, all the edges, and under furniture. Every window is cleaned as well as the runners. Curtains are cleaned or dusted. Books are taken off the shelf and individually dusted, the shelves are dusted and each book is returned to its correct location. Office files are caught up. Cupboards are reorganized and re-stocked. Drawers and closets are gone through and organized. Media is organized and dusted. Appliances are cleaned out. Bathrooms get an extra deep scouring. You get the idea. After I make the list of all the cleaning projects room by room on my computer, I print it out on colorful paper. For this Fall clean up I chose pumpkin Orange, and added a few fall stickers for fun, and staple it together. I cross things off the list as they are completed, which is very motivating as the list gets smaller and smaller. I also enlist everyone in the family for various tasks. This is also a wonderful time to remove any clutter that you are no longer using. Toys and clothing the kids have grown out of, books you may wish to pass on, etc. I also like to list out things that need fixing or replacing- my bathroom fixture is broken and needs replacing, the dogs scratched up the paint under the office window, and the garage door- these need repainting. I have a missing towel rack. The dog ate a hole about a foot in diameter through the center of my comforter - we are using a lighter summer blanket in the mean time, but need to replace it before winter. Stuff like that. Putting on some nice music and lighting a scented candle makes cleaning more enjoyable. I also like to set the timer and see how much I can get done in 15 minutes- after a few sessions, time for a break. Maybe a nice cup of tea or cool drink, and a few minutes of a favorite show, then back to work. Fun projects can also be under taken during this clean up- I plan to update my Halloween scrapbook. I always have fun decorating for fall. I also plan all of my holiday meals and gift list at this time- that way I can plan ahead and find things on sale. It is very rewarding to work on this big clean up- I love the way the house feels after a big clean up- plus it makes it much easier to keep up with every day cleaning when everything is organized. Today was the first day back to school for my son - who started his freshman year of high school. My daughter will start tomorrow as a Junior. The weather was very appropriate for back to school, and decided to be a nice fall-like day- overcast and all. No, I am by no means ready to say goodbye to our very short summer season, and my tomatoes are definitely not, but it was nice for the house to be cool. I decided that today would be the day to get started on baking up some of my giant Zucchini, and turning them into some yummy breads and cake. I thought it would be a nice treat for Joseph to come home to the house filled with nice baking smells and a homemade after school snack. So I got to work and baked three loaves of zucchini bread and a yummy chocolate zucchini cake for our dessert this evening. 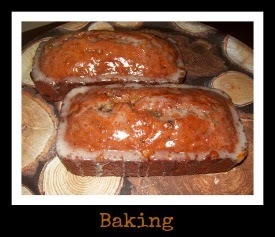 I love baking zucchini bread- the whole house always smells so good. 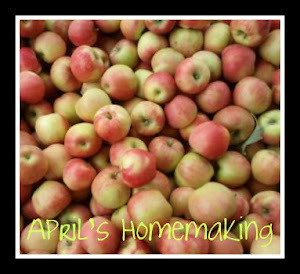 I thought I would share with you the recipe that I have always used, I am not sure which one of my family members passed this recipe down to me, I just know that it has been on the same recipe card since I was a young homemaker, and probably came from my grandma or mother. This recipe always turns out well. I always make extra for the freezer- when the loaves are cool, pop them into a freezer bag, and into the freezer, it is great to have these on hand, just pull them out of the freezer to thaw when you are ready for another loaf of bread, great time saver. Beat eggs, then mix in the rest of the ingredients until combined. Pour into 3 greased bread pans. Bake at 325 F. for 45 minutes to and hour. I Bake these in Pyrex bread pans, and also sometimes a muffin pan or a square 9x9 inch cake pan- just add a little frosting and your bread is now a cake. I used to grate my zucchini by hand, but since I like to make this recipe in bulk, I started last year, using a food processor from my mother-in-law to grate the zucchini, since the zucchini comes out in fairly big pieces, I put the grated zucchini, along with the eggs and oil, in my blender, and blend them all together to break down the zucchini more. This works very well, and saves me a lot of time. I also made a chocolate zucchini cake- I only started making chocolate zucchini cake a couple of years ago when I found a great recipe online. I had had chocolate zucchini cake at a birthday party when I was a child, and loved it, but never got around to getting a recipe. Boy am I glad I found this recipe! 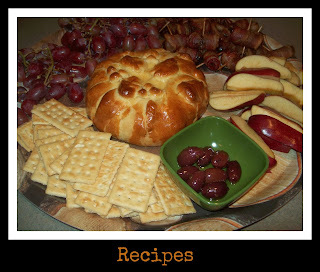 Wonderful, moist, chocolaty, and easy to make with inexpensive ingredients. I found this recipe on allrecipes.com - turns out great every time- I serve mine with a simple white frosting. I would highly recommend this recipe to everyone. The bread was a perfect after school snack, and we are all looking forward to chocolate zucchini cake for dessert. 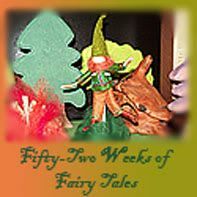 I really enjoy crafting- I love to needle felt, sew, and scrapbook. My son enjoys drawing, my daughter loves to knit and put together puzzles. My children both put a lot of effort into school projects as well. The whole family loves playing games together. Most often these projects take place in the dining room. I thought I would show a few pictures of our dining room crafting areas and how we store our games. Craft supplies can sometimes be difficult to get organized when you don't have a devoted craft room. To tackle the problem of having stacks of craft supply totes sitting in the corner of my dining room, I found this wonderful cupboard. This cupboard is nice and deep and my totes fit neatly inside. 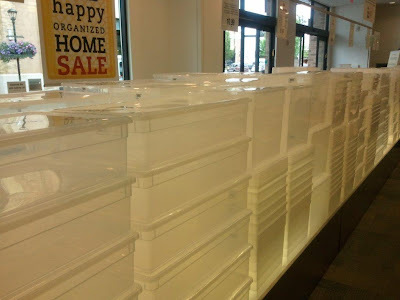 One of my best organizational tips is to buy matching totes- this way they stack better. For years I had so many different totes, they wouldn't stack well, and didn't look very nice- when I decided to narrow my totes down to a few styles that all worked well together, it made organizing much easier. The old totes went on to be re-purposed in many ways- so they were not wasted either. Here is what the cupboard looks like inside. These totes are primarily for my felting supplies as well as some of my sewing supplies. The biggest tote holds my basic wool, the smaller totes hold my dyed wool, as well as some of my doll making supplies and flower fairy flowers. In the bottom drawers I keep my sewing needles, as well as small boxes and freezer bags holding individual projects- here is a small tote with all of my wool felt ball pieces already cut and ready to go. Keeping individual projects in progress in their own tote is a great way to keep track of all of the parts and patterns. Right across from the dining room is our coat closet- along with coats it houses all of my scrapbooking supplies, stickers, and some of my special toy collections. 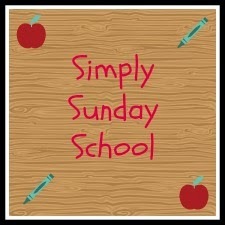 My scrapbooking supplies are also available to my children for all of their school projects. Again, for the most part I use similar shaped totes to keep everything easy to stack. We keep most of our children and juvenile fiction in the dining room as well, in the bottom drawer we keep a nice selection of school supplies so they are easy to access during homework time. Here is the school supply drawer- filled with colored pencils, pens, pencils, crayons, scissors, glue sticks, tape, and lots of index cards for taking notes and making flash cards. I still keep the tins of beeswax block crayons in here as well (my favorite) this way I am prepared when any little ones come to visit and want to color. This is the hutch in the dining room- which holds more children's literature as well as all of our family games. Here are our games neatly tucked away, ready to pull out for a family game night. 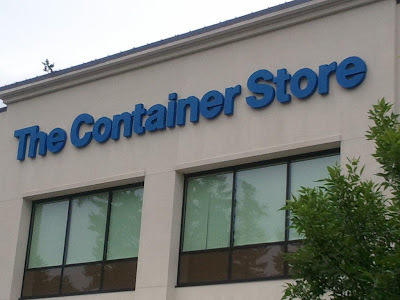 I just love to organize- this summer Gary and I were in a city about an hour from where we live with a lot of interesting stores- I stopped in at one of my favorite stores to browse- The Container Store. I only get here once a year or so ( I am not too fond of long car rides). So I had to takes some pictures. 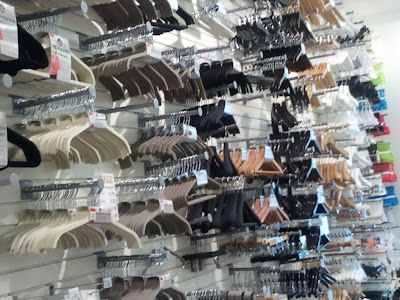 I love the selection- we use all black hangers in our home- I love using all the same hangers- keeps some order amongst all the colors of clothing. Here's where I found the perfect sized tote for one of my projects. 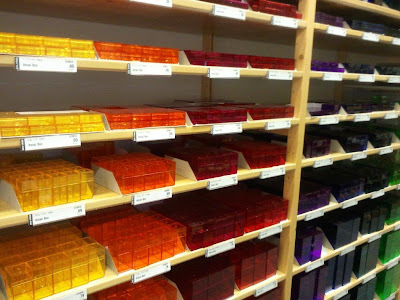 I loved all of these little colorful boxes- these could be good for so many different little things. Such a fun store! As summer winds down, I always get the organizing bug, I love getting things ready for the new school year, and for fall. Last night, in the middle of the night, we had a wonderful late summer thunder and lightening storm. My lab pup Zoey was a bit anxious about it, so I stayed up with her, and watched the storm. Summer is winding down, and I am looking forward to the new school year on Monday. My prayers and thoughts are also with everyone in Hurricane Irene's path. One of favorite dinners is a Pot Roast Dinner. Growing up my mother would make very nice Sunday Dinners, most often we had Pot Roast or Roast Chicken. We would all look forward to these delicious meals. Pot Roast is a wonderful meal that always tastes great, and is easy to prepare. Whenever boneless roasts are on sale, I buy a couple. Pot roasts don't need to be the most expensive cut of meat either, since they cook for quite some time, even an inexpensive cut of meat turns out tender. Last week, as an anniversary treat for my husband, I decided to cook him one of his favorite meals- Pot Roast Dinner. The meal turned out wonderfully, and the whole family really enjoyed our meal. I thought it would be good to share the easy step by step process of cooking a Pot Roast Dinner. First brown all sides of your pot roast in a large pot. Make sure you watch carefully as it can brown very fast. I learned this lesson when I was a young homemaker- I left the pot roast to brown and got distracted with something- next thing I know my house is filled with horrid smoke. Fortunately no fire- but it was so smokey I brought my two children who at the time were like 3 and 4 years old and put them on a lawn chair outside- then went back in to retrieve the smoking pan- which I set outside to cool off. Then had to open all the windows and doors to air out the house-the smoke detectors were beeping and smoke was billowing out the front windows and door. Which was very embarrassing because I lived right next door to a fire station! Luckily there was no need for them to come over. Lesson learned- never leave browning meat unattended! When the roast is browned on all sides add water to the pan until it reaches the top of the roast without covering the roast. Add a large chopped onion or two medium chopped onions. Season with salt and pepper and I use a few dashes of Italian herb blend. Bring to a low boil, then reduce heat to simmer and cover. Check on it occasionally to make sure it is at a nice simmer- add more water if needed to keep water at the same level. Simmer for at least 3 hours and between 3 and 5 hours, before adding other veggies. This can also be done in a crock pot- after browning roast on the stove- you can transfer the roast to a crock pot- be sure and de-galze the browning pan with a little water and add it to the crock pot- this will help give the liquid flavor for the gravy. When I cook mine in a crock pot I cook it on high for 6-8 hours. After pot roast has simmered for 3 hours add to the pan some baby carrots or chopped carrots. This time I made roasted red potatoes but I often just add small red potatoes to the pot roast pan at this same point. Add more water for veggies if needed. Continue to simmer until veggies are cooked through. Instead of steamed potatoes this time I made roasted red potatoes. Clean as many red potatoes as you will need for your family. Cut into bite size pieces as shown below. Drizzle with a couple tablespoons of olive oil, enough so potatoes have a thin layer of oil on them- then add a little salt and pepper, Italian herb blend and a few dashes of paprika- all to taste. Then toss until all potatoes are coated with herbs and spices. Coat rimmed baking sheet with a little olive oil and spread out potatoes on pan. Bake at 375 F. until they are browned and tender. Turn potatoes about halfway through cooking. 40 minutes to an hour depending on how many you are cooking and how your oven runs. Just before serving when the pot roast is done- remove roast to a serving plate- remove veggies with a slotted spoon to a serving plate. Then use the leftover broth to make a simple gravy. I make my gravy by adding 3-4 T of butter to a sauce pan and melting on medium high- I add to the butter between 1/4 and 1/3 cup flour. I cook over medium high heat stirring the whole time until it forms a paste- I then add a ladle of the hot broth to the pan and whisk until smooth, then I add half of the rest of the broth, whisk until smooth- it is usually very thick at this point- I add the rest of the broth- whisk until smooth- still over medium high heat- then I slowly add milk- whisking in between until I have enough gravy- I add salt and pepper to taste- and whisk gravy until it reaches desired consistency. My family loves this gravy. Serve meat with the gravy- the meat should be so tender that you can easily cut it with a fork. My whole family loves this classic special meal. I hope yours will too! As summer winds down we have been very busy preparing for school and getting in all of the garden produce. We also are squeezing in as many more summer fun days as we can before school starts up and we enter the fall season. This last Saturday we had a fun day- we started out the day very early with our garage sale. We had planned to have one all summer long and decided that this weekend was it. Although it was one of our hottest days yet, we had many people stop by. By 2:00pm we had cleared out the majority of our items, sent the rest off to Goodwill, and cleared up our signs and tables. We decided to use our earnings by heading out to the county fair. We love the county fair, we know many people who are involved in 4H and my daughter's good friend made finals in the talent show, we always run into people we know, and always have a wonderful time. All of the different food stands put out such yummy smells- we had footlong hot dogs and teriyaki chicken for dinner. After getting a bite to eat we spent a little time looking at the all of the birds, I love chickens so this is one of my favorite areas to look around. This was a particularly handsome Bantam Rooster. On our way to the talent show we were planning out some of our stops for later in the evening, as well as what other fair food we would have to sample. We got seated for the talent show, and loved listening to all the very talented singers and musicians. Here Sarah has found some of her friends from school as well as her friend Sedona who was in the talent show and did an excellent job singing! During a break in the talent show we quickly headed over to the goat and sheep barn, and had a blast checking out all of the cute goats and sheep - so fun to pet and look at all of the different varieties. This little cutey came up to say hello- I just love Goats! After the talent show we decided to check out some of the rides and carnival games, we don't normally go on any of the rides, as they are pretty spendy, but we decided to all go on this one- when I was a child it was called the Gravitron, and has always been my favorite ride. The whole family agreed that it was a very fun ride, and is a great way to experience centrifugal force. We let the kids play one carnival game- the classic pop the balloon with a dart- they both won a little stuffed alien- Sarah was happy with hers, and Joe was more than pleased to give his to me wondering what on earth he would do with a stuffed alien. Gary's favorite stop was next- corn on the cob! We all had some yummy corn on the cob covered in butter and listened to an fun country band that was playing. We ended the evening with one more favorite fair treat- a funnel cake- we love to share these- along with a frozen lemonade drink. Fair time is so fun- brings me right back to my childhood, I love sharing this tradition with the family!! Now for a garden update- today we got out to the garden for some harvesting. Sarah and Joseph brought in the last of the green beans, and cleared the garden bed so we can plant a fall crop of Kale and Swiss Chard. We saved all of the green bean plants, and will run them over with the lawn mower to chop them up and add to the compost pile for next year. My little corn patch is doing well, and I am looking forward to seeing them in my yard during the fall. We brought in a bunch of large zucchini that we will turn into breads, cakes and fritters this week, and our pepper plants are all doing well. We will have a big batch of jalapeno poppers this week as well as some stuffed green peppers and green pepper and egg sandwiches (My hubbies childhood favorite). We also harvested our first ripe full sized tomato- if this sunshine keeps up we should have quite a few more over the next couple of weeks. Hope everyone is enjoying their summer- I look forward to posting some of our garden recipes later this week. 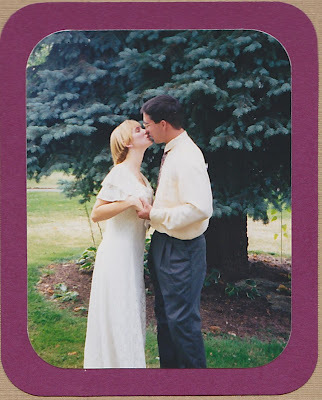 Tomorrow ( August 19th) is Gary and my 17th anniversary. 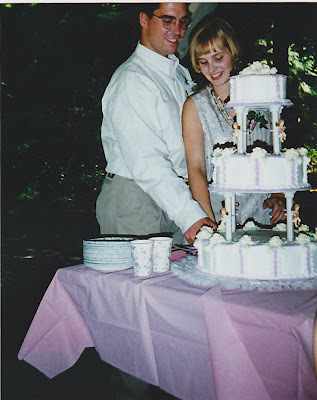 In honor of our special day, I thought I would share a blog post about our wedding story. 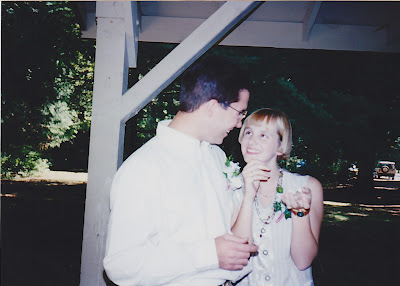 Gary and I first met while we both worked at Fred Meyer grocery store, I was 16 years old at the time. After a couple of years I went to work at the mall, but we ended up having Biology class together in community college. We started to get to know one another more when Gary tutored me in Biology - for some reason even though I aced Bio in high school I could not do well in college Biology- I aced the labs but had a very hard time sitting through lectures. Gary did a great job tutoring me on a unit about synaptic connections and to this day it is one portion of my biology class that I actually remember. Despite Gary's help, my inability to sit through painfully boring lectures made it so I never passed the class - not even on my second and third attempts, and my poor biology grade remains the lowest grade on any of my transcripts to date- yikes!! Time went on and I hadn't run into Gary for quite a few months. I was on my way home from work one evening and needed to pick up some groceries- instead of going to a grocery store nearer to my apartment, I decided to stop in at my old work place for groceries. Gary still worked there, but he wasn't working that evening. I was leaving the store with my purchases, and as I was leaving Gary happened to be coming into work to pick up his pay check. Since we hadn't seen each other in quite some time we thought it would be good to get together, so we exchanged numbers, and made a plan to hang out the next evening. 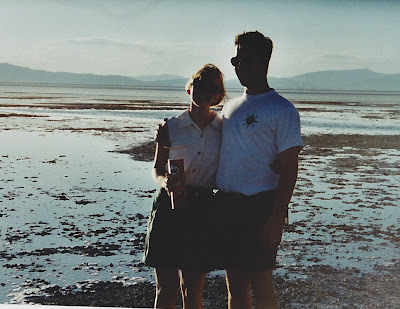 From that evening on we saw each other every single day- we became engaged about 6-7 months after we started dating and about 10 months after that we were married. It is clear to me that God brought us together- although we have opposite personality traits, we complement each other very well. Gary and I are best friends, and love being together. There is no on else on this planet I enjoy being with more than my hubby!! We planned our wedding for mid August, we wanted an outdoor reception, and in Portland,Oregon, mid August was the most likely chance for no rain. 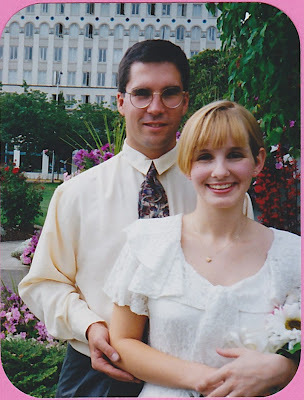 Gary was a new Christian at the time and neither of us were attending a church, so we decided to get married down in Corvallis, Oregon, at the oldest courthouse in the state. My sister and her college sweetheart were married there earlier in the year, and I thought it would be neat that we were both married in the same place. So early in the morning of August 19th we made the drive down to Corvallis, along with my Mom, sisters, Gary's parents and brothers, and our maid of honor and best man. I was a little concerned that morning as it was sprinkling- but the sun came out soon enough. I was really into antique white and dusty rose at the time (my Victorian phase) so these were our wedding colors. It was such a beautiful day the judge suggested we have our ceremony outdoors. The courthouse garden was beautiful- the courthouse itself looked like it had been decorated for a wedding, the stairs were lined with beautiful flowers. I couldn't have asked for a prettier place. The judge went above and beyond his duties of a simple ceremony and even gave a little talk about the importance of marriage- he did a really nice job. Here are a few pictures of the ceremony. 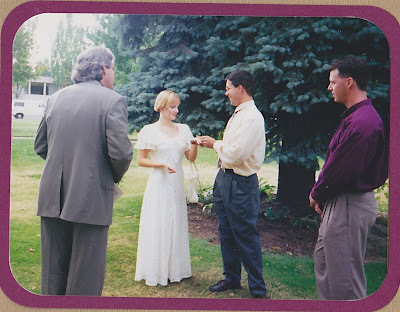 In this picture we are exchanging rings. Here we are after the ceremony. Only our Parents, siblings and my good friend Tanya my maid of honor, and Gary's good friend Todd his best man, were at our ceremony. I really enjoyed that it was a small and private wedding. We all went out for brunch afterwards, and then Gary and I left on our honeymoon- we did things a little backwards, and had the reception when we got home. Our honeymoon was very fun- we took a week long trip all around Oregon. We are both outdoor enthusiasts, and were excited to explore Oregon. We camped out the majority of the time, and stayed in hotels a couple of times as well. The first night we camped in Bend, Oregon. The next day we hung out in Bend then started our drive to Crater Lake -our second evening destination. 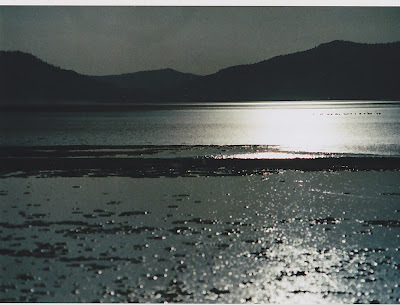 Our next destination was Goose lake on the border of Oregon and California. 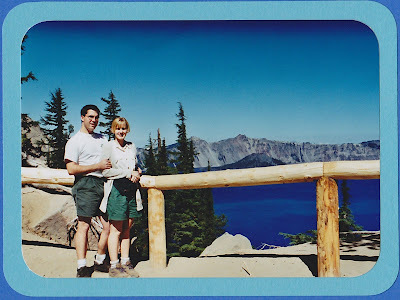 Now these were pre-internet days, and I only had maps to plan out our trip- on a map Goose lake looks like a big beautiful lake, so we thought it would be a very nice place to camp. Now I'm not sure what Goose lake is like during other parts of the year, but that August it looked like this. We could see that there was water way off in the distance, and I have this OCD thing about touching a body of water when I am at that body of water. If I am at a lake or Ocean or river, I want to touch the water. 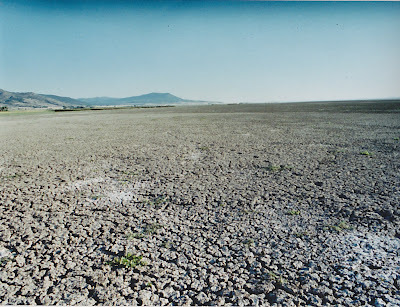 So we decided to hike on out- and it was a long hike- through dried up river bed- along the way we saw animal tracks that looked a lot like a large cat - it was a bit freaky because we were way out past were any people were. 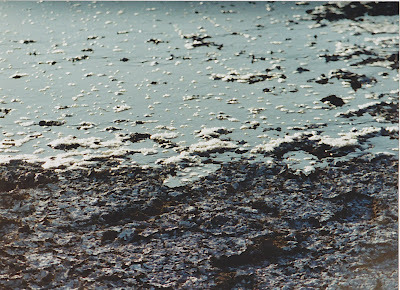 We hiked for quite some time, then soon we got to a more mucky part. We were convinced that if we believed in a thing like primordial ooze (we are creationists so we don't) that it would look a lot like this. We got river bed muck all over our nice new hiking shoes- I thought it was pretty cool though, so I never cleaned it off my shoes, it dried up into grayish powder, which to this day a little bit remains on my hiking shoes, which I have saved even though they stopped fitting after I had children and my shoes size went up by a half size. My shoes and these pictures are a fun reminder of this cool adventure we had on our honeymoon. Gary brought his camera and tripod with him and set the timer to get a picture of us at Goose Lake. Looks like I am holding a can of Pringles- which to this day is our favorite road trip food- every road trip we take we bring Pringles. After Goose Lake we drove through Southern Oregon, and even dipped down into Nevada for a few hours. We were trying to find some cool spot, but took a wrong turn and ended up on this road for a long time- we could see no end in sight, and after driving on it for a very long time we decided we would turn around and go back so we wouldn't run out of gas in the middle of no where. 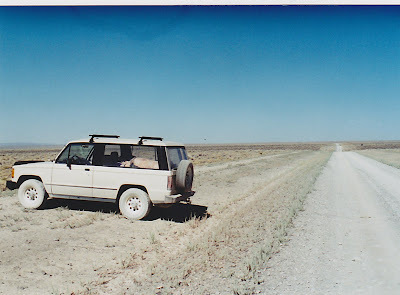 Before we turned around we pulled over to get a few picture of our Trooper (one of my most favorite vehicles ever) it was covered in so much dust. Glad we didn't get stranded out there- what did we ever do without cell phones and GPS!! This was a very memorable part of our honeymoon. 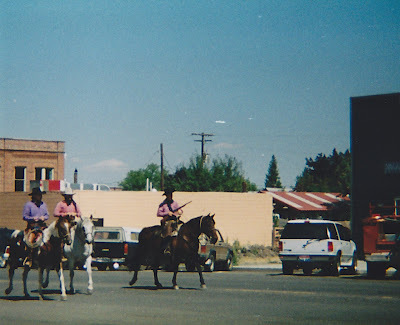 We pretty much just drove all day that day, stopping along the way in Denio, Nevada- a tiny little town, for lunch. We ended up that evening clear in Ontario, Oregon. We did a lot of driving on our honeymoon, and we listened to the soundtrack to The Lion King for a large portion of the time. We loved the Lion King and saw it in the theater when it came out that year- I can't wait for it to be re-released in October. 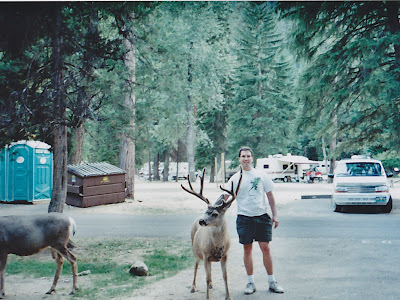 Our next stop was Wallowa Lake- this was a fun place to camp- the lake was beautiful, and the deer were so tame you could pet them- which we thought was pretty cool! We visited the town of Joseph and watched a reenactment of the famous Joseph Bank robbery, we also had fun going through the different historical museums and buildings. After that we made our way through Eastern Oregon, spent the night in Pendleton, and then back to Portland. 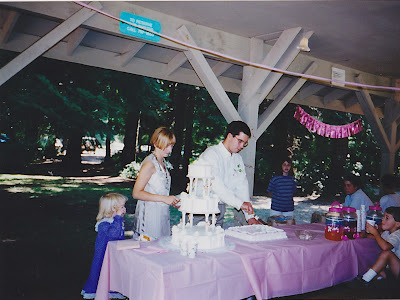 When we got back it was time for our reception- we held the reception at my favorite childhood campground- Oxbow Park on the Sandy River. The location was so pretty- My sister and brother in law got there early and helped us decorate. We picked up our own food - we had ordered all of our food from the Fred Meyer store were Gary still worked and where we first met. We were friends with everyone from the deli and bakery, and they did a very nice job on everything. We had live Celtic Music - wonderful musicians Brenda and Jim - I just found their link!! http://musicbyinnisfree.com/ The music was a nod to my Celtic heritage, and was perfect for our outdoor forest setting. Our friends and family joined us for a nice afternoon of good food and music by the river. Here we are getting ready to cut the cake. The cake was very good- a simple white cake with raspberry filling. We set out disposable cameras for everyone to snap pictures, which was fun, and we ended up with all sorts of nice photos. Our wedding and reception were both simple and beautiful, we stayed within our budget and had plenty of money for our honeymoon. I liked that our wedding was simple and very down to earth- it allowed the focus to be on what was important- our marriage. 22.Then the Lord God made a woman from the rib he had taken out of the man, and he brought her to the man. 23.The man said, "This is now bone of my bones and flesh of my flesh; she shall be called woman, for she was taken out of man." 24.For this reason a man will leave his father and mother and be united to his wife, and they will become on flesh. I also love the passage in Ephesians 5:22-33 that talks about wives and husbands. 6. "But at the beginning of creation God 'made them male and female.' 7. 'For this reason a man will leave his father and mother and be untied to his wife, 8.and the two will become one flesh.' So they are no longer two, but one. 9.Therefore what God has joined together, let man not separate." We are both committed to having a life long marriage, as well as a happy and loving marriage. This following passage is a good one to read about love. 4.Love is patient, love is kind. It does not envy, it does not boast, it is not proud. 5.It is not rude, it is not self-seeking, it is not easily angered, it keeps no record of wrongs. 6.Love does not delight in evil but rejoices with the truth. 7.It always protects, always trusts, always hopes, always perseveres. This verse is filled with so much wonderful advice! I just love it! 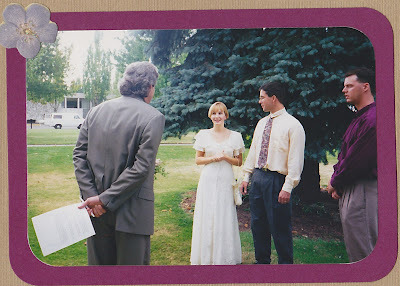 So that is our wedding story- we sure look young in all of these pictures!! To my dear and wonderful husband Gary- I love You! Happy 17th Anniversary! !